Software catalogue, 1970, Log, PDF. Software - Information Technology: Its New Meaning for Art was an exhibition curated by artist and critic Jack Burnham and held at the Jewish Museum in Brooklyn, New York City, from 16 September - 8 November 1970, and the Smithsonian Institution, Washington, D.C., from 16 December 1970 until 14 February 1971. The show put together computers and conceptual artists, linking them through the idea of software as a process or a program to be carried out by a machine or by the audience based on "instruction lines" formulated by the artist. Participating artists: Vito Acconci, David Antin, Architecture Group Machine M.I.T., John Baldessari, Robert Barry, Linda Berris, Donald Burgy, Paul Conly, Agnes Denes, Robert Duncan Enzmann, Carl Fernbach-Flarsheim, John Godyear, Hans Haacke, Douglas Huebler, Joseph Kosuth, Nam June Paik, Alex Razdow, Sonia Sheridan, Evander D. Schley, Theodosius Victoria, Lawrence Weiner. Software - Information Technology: Its New Meaning for Art, New York: Jewish Museum, 1970, 71 pp. Jack Burnham, "Comments on Mallary's Note", Leonardo 3:2, Apr 1970, pp 265-266. A response to Robert Mallory's review of the Software show, in the same issue. Robert Mallory, "Notes on Jack Burnham's Concepts of a Software Exhibition", Leonardo 3:2, 1970, pp 189-190. Grace Glueck, "Jewish Museum's ‘Software’ Confusing", New York Times, 26 Sep 1970. Review. 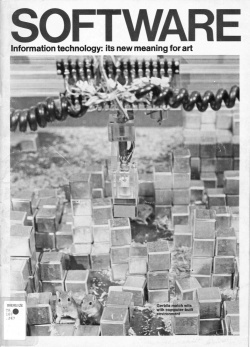 Bitite Vinklers, "Art and Information: 'Software' at the Jewish Museum", Arts Magazine 45:1, Sep 1970, p 46. Dore Ashton, "Software Everywhere: Jewish Museum, NY, exhibition", Studio International 180, Nov 1970, pp 200-202. Jack Burnham, "Duchamp's Bride Stripped Bare: The Meaning of the Large Glass", Arts Magazine, Mar-May 1972. Large Glass (1915-22) served as an architectural model for the installation of the Software exhibition. Jack Burnham, "Art and Technology: The Panacea That Failed", in The Myths of Information, ed. Kathleen Woodward, Coda Press, 1980. Edward A. Shanken, "The House That Jack Built: Jack Burnham's Concept of Software as a Metaphor for Art", Leonardo Electronic Almanac 6:10, Nov 1998; repr. in Reframing Consciousness: Art, Mind and Technology, ed. Roy Ascott, Exeter, UK: Intellect Books, 1999. Noah Wardrip-Fruin, Nick Montfort, "From Software - Information Technology: Its New Meaning for Art", in The New Media Reader, 2003. Vincent Bonin, commentary about the exhibition and catalogue, Daniel Langlois Foundation, 2004. (Also in French). Edward A. Shanken, "In Forming Software: Software, Structuralism, Demythification," Icono 12:2, 2014, pp 9-28. This page was last modified on 3 March 2019, at 15:05. This page has been accessed 25,245 times.